I’ve been in touch with Shelly since then and have had regular correspondence with him. Recently they have finished some interesting work he decided to share with me – thanks Shelly. Jatalla is a general web search engine, but the next version will be integrated with a user-generated and user-maintained dictionary and thesaurus called the “Lexary“. Users will add and update dictionary entries in the dictionary, but these edits must be “ratified” by the community before they’re made official, thereby avoiding the spam/vandalism problems that plague Wikipedia and other user-maintained sites. 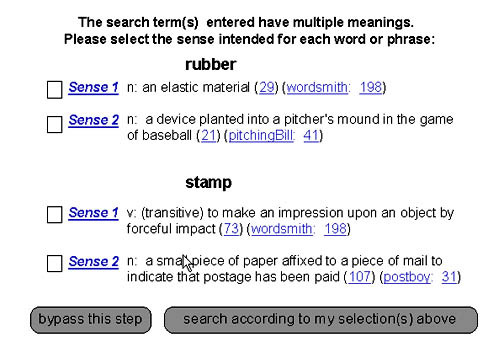 But more specific to the search engine feature: After you perform a web search, you are asked to select a “sense” — drawn from the user-generated dictionary–for each term you searched. This mechanism allows user-disambiguation on the fly by the person submitting the search, such that you can do a search on “bears” without having to find references to the Chicago Bears, etc. (unless you want to of course!). You can also bypass this feature and just search so that you get all kinds of pages with all kinds of bears mixed in together (like you do now when you search Google for “bears”). Keep up teh good work Shelly !